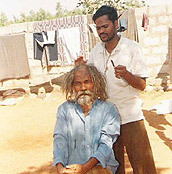 F.B.A has gained the goodwill and friendship of several social workers, police officers, hospital staff, railway staff and the general public; these kind people help us by either picking up destitutes from the streets and bringing them to our ashrams or by intimating us the location facilitating us to bring a new inmate to our ashram. 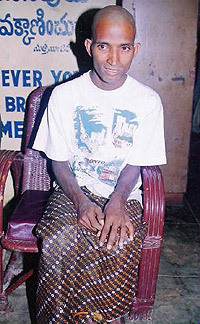 Above in the photograph is Mr. David, a social worker who is a great help to us. Here he brings three men from the nearby railway station. Sin has disfigured the image and likeness of God in Man. When a naked person comes to our ashram, he receives God's love through the serving volunteers and thus he is made beautiful again. Recovered from the world of evil and dirty and sinful life, these souls are helped by the volunteers to clean themselves. 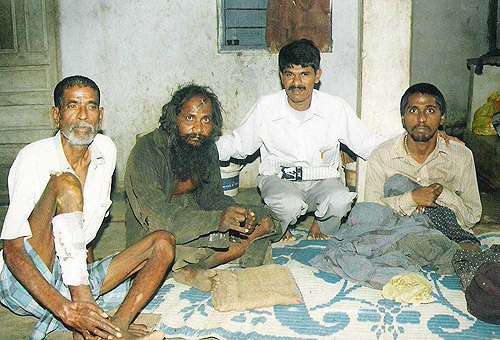 These souls are first given a shave followed by a bath and given a new pair of clothes. He is given a good meal. He is then checked for injuries and bandaged or given some medical attention. The naked person shown above is now transformed into a dignifed, beautiful creation of God. One of F.B.A's missions is to build communities, communities of love, fellowship and brotherhood. These families or communities thrive on the Love of God. You can be part of this community by being a brother / sister to the ashram communities whenever convenient.